Everyone knows Michael Jordan is The Man. If you don't think so, you may want to leave this page now... Otherwise, you are about to witness THE greatest collection of Jordan videos and pictures on the web! I've accumulated every single Jordan video I could possibly find, and have put them here. 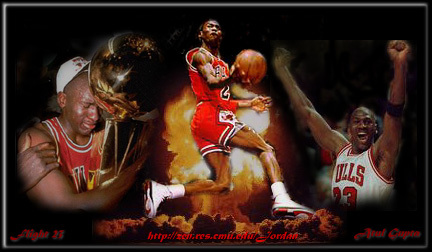 I also have over 420 images in my MJ galleries, including everything from basketball to SpaceJam. I've decided not to put up any statistics on this page yet, mainly because so many other pages on the web have them, and I wanted to do something unique. If you want more info on Jordan's career statistics, check Sportsline USA or my links to other Jordan pages.. If you like what you see, please take a minute to read this. Also, I am looking for back issues of Sports Illustrated with Michael on the cover so if anyone has them and is willing to part with them, please email me. Well, here's what you've all been waiting for, click on what you want to see. Five championships, five choices.. okay, well, Im still working on the fifth one... so for now there's still only four choices. Most of these pages are graphic-intensive, so if you have a slow connection (below a 28.8 modem) to the web please be patient. Each page is about 150K. If you think I should have some text-only pages, email me and let me know. This page was created in November of 1996. Last update: October 17, 1997. If you have any comments, contributions, or suggestions for this page, please email me, Atul Gupta, at [email protected]. I am NOT Michael Jordan.. I am merely a weird guy. And stuff.